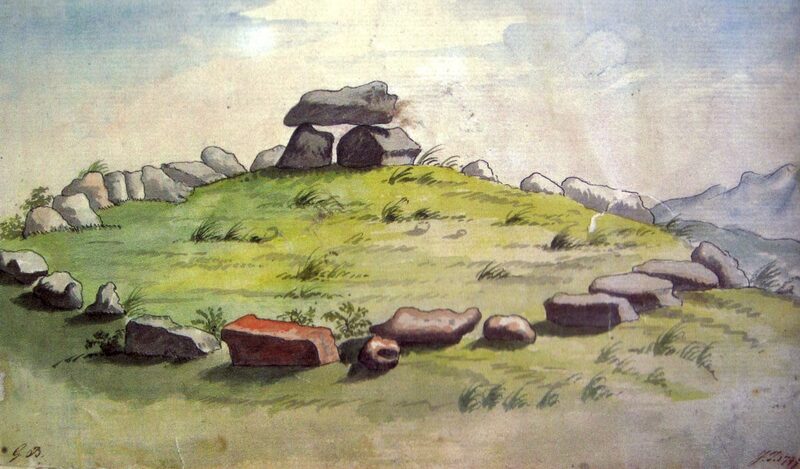 The Kissing Stone or Leaba na Fian at Carrowmore in County Sligo, copy of an illustration by Gabrial Beranger. The Reverend Charles Henry visited Carrowmore in 1740, and left the first written account of the monuments. He considered the circles to be the graves of warriors slain and fallen in the legendary Battle of Moytura, which was said to have taken place by the shores of Lough Arrow. "June 23rd, Mr. Bigary not wishing to ride, I went with Mr. Irwin and his son on horseback to Knocknareagh mountain, — seen on the lands of Carrowmore, in the space of a square a quarter of a mile, eighteen circles of huge stones, some with their Cromleghs in the centre standing, some down, but the stones lying on the spot; designed and planned the largest one. Sure it is, that they are not Temples, nor the Cromleghs altars, as the antiquarians pretend, but burial places of chieftains. These eighteen together (I think) settles the matter, and prove this place to have been either a cemetery, or the spot where some famous battle was fought, and the heroes which fell to have been interred on the field where they were slain; but I believe, if some of the antiquarians had heard of eighteen being together in one spot, they would not have called them Temples." The first Map of Carrowmore by Beranger, 1779. Roger Walker was a Queens Counsel and local landlord, with an interest in collecting relics from ancient monuments. Walker opened and excavated at least 20 of the Carrowmore monuments, avid to find artifacts for his private museum at Rathcarrick House on the east side of Knocknarea. He kept poor records of his digs and his finds, and shortly before his death he sold off his collection to the Duke of Northumberland. Roger Walker is a fascinating character, and a paper has been published by Aideen Ireland covering his life and career. Considered by many to be the founder of modern Irish archaeology, Petrie was also an artist, musician, collector, writer, and much more. During the 1830's he was working for the Ordinance Survey and on August 2nd, 1837 he arrived at the house of his friend Roger Walker to commence his survey of the Carrowmore circles. 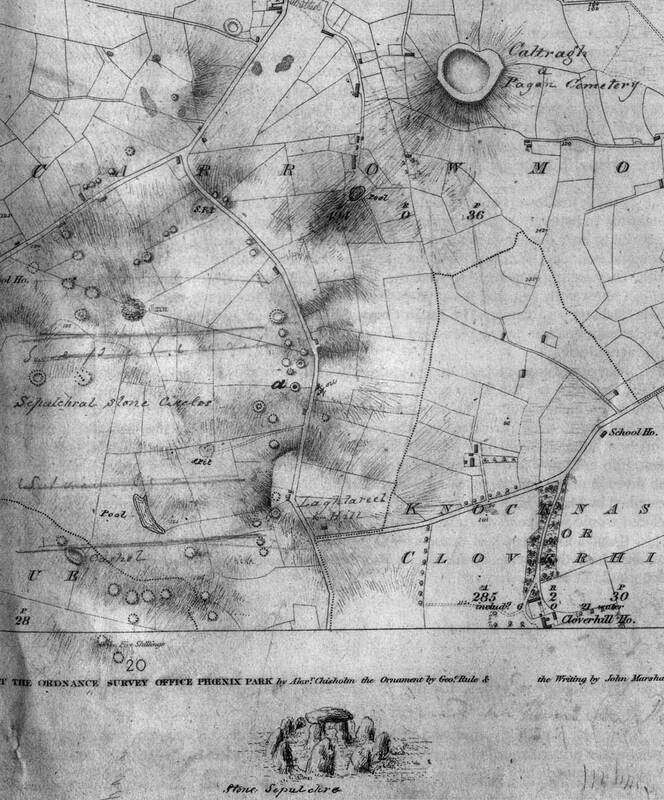 A series of letters survives in the Ordinance Survey archives with details of Petrie's survey. He was shown about the circles by Walker, who had already rifled most of the monuments, discovering some valuable artifacts which were in his private collection. Petrie also collected artifacts, and is known to have posessed a bronze pin from Carrowmore (possibly Circle 17), no doubt obtained from Walker. 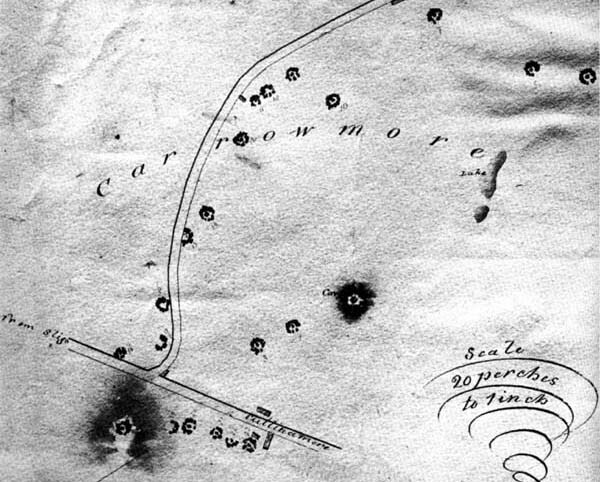 George Petrie's draft map of Carrowmore from 1837. 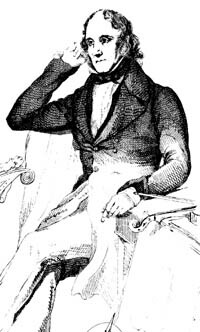 Wakeman was hired by Colonal Cooper to illustrate the antuquities of County Sligo and the adjoining areas. 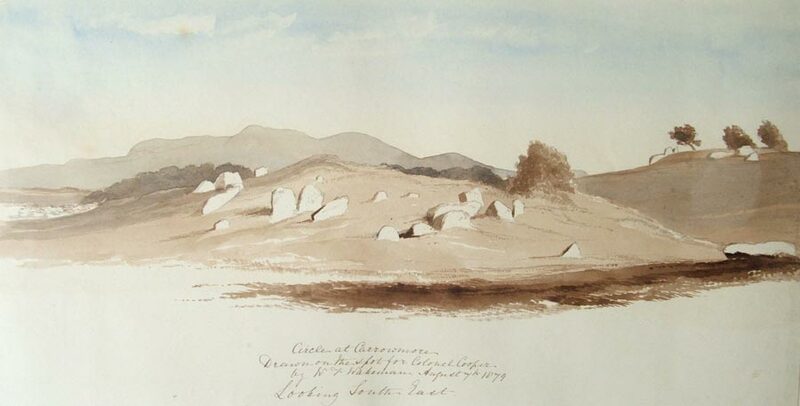 He completed his sketches in 1879 and 1880, and left some beautiful watercolors of Carrowmore a hundred years after Beranger's visit. Wakemans sketchbooks are kept by Sligo County Library; a second series has a detailed set of images from Inishmurray, and led to a book by Wakeman on the Island. His Carrowmore illustrations are reproduced on their relative pages. Wood-Martin was a local Sligo landowner with a keen interest in archaeology. He wrote several books including Rude Stone Monuments, the History of County Sligo in three volumes, and published a seminal work on crannogs and lake dwellings. 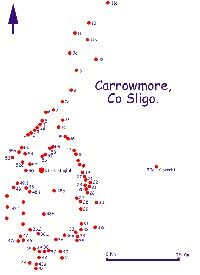 George Elcock visited Carrowmore in the early 1880's and interviewed locals about the sites. He also illustrated several of the monuments, and some of his drawings were used by Wood-Martin in the Carrowmore section of Rude Stone Monuments. The photographer took a number of images of Carrowmore on trips to County Sligo between 1900 and 1911. Goran Burenhult led the modern excavations at Carrowmore, when ten monuments were excavated over a number of seasons. Padraig Meehan is an independent researcher and works as a seasonal guide at Carrowmore. He has published a book on Listoghil, the central monument at Carrowmore, which details the alignment of the central dolmen to the sunrise at Samhain and Imbolc. Circles at Carrowmore by William Wakeman, August 7th, 1879.